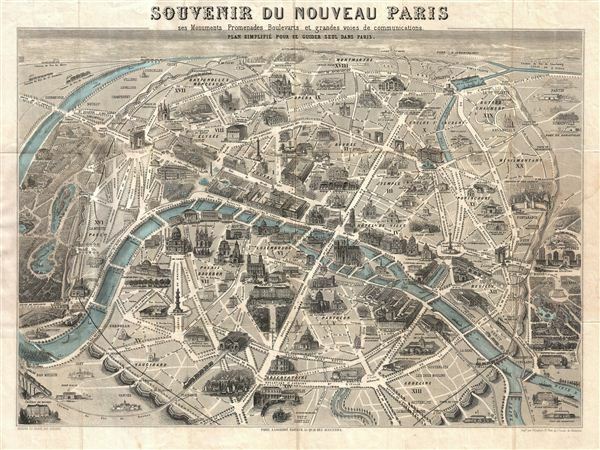 One of the most appealing tourist view maps of Paris to appear in the mid-19th century. Souvenir du Nouveau Paris ses Monuments Promenades Boulevards et grandes Voies de Communications. An exceptional 1867 monumental map and view of Paris, France. Drawn by Henri Guesnu, this map, as the title suggests, is a map of the 'New Paris,' as redesigned and rebuilt under Napoleon III by Baron Geroges-eugene Haussmann. Known in French as the Grands Travaux, Haussmann's redesign of Paris defined it as a modern city, with narrow alleyways and confusing streets replaced by a broad network of grand boulevards, imposing facades, parks, and monuments. This map, which was prepared with the tourist in mind, shows major monuments in profile and is one of the earliest and most appealing examples of its genre. Published by A. Logerot of 55 Quai des Augustins, Paris. Hilaire Guesnu (1820 - 1868) was an engraver and printer active in Paris during the mid-19th century. He worked with a number of publishers active at the time, including Logerot. Cartographically he is known for two exceptionally desirable view maps of Pairs, his tourist monument map of Paris, and a view of Paris from the Bois de Boulogne. Very good. Original fold lines exhibit some wear. Old closed repair from top through 'u' in 'Souvenir' extending 1/3 of the way into the page - not exceptionally noticeable - see image. Folds into original binder. Vallee, Leon, Catalogue des plans de Paris et des cartes de l'ile de France, (Bibliotheque Nacionale) 1964-1965.